A few hundred feet higher and the confluence of the Tanana and Delta rivers is an impressive sight. 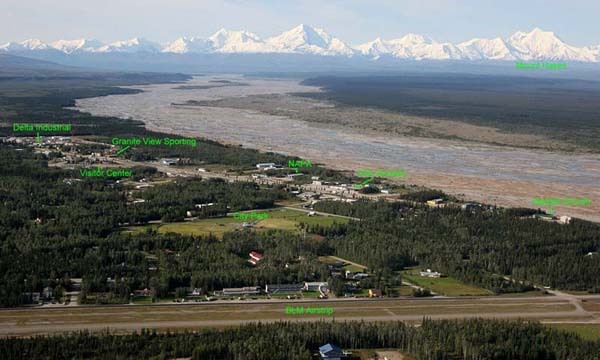 Extending north from the massif that is known as Donnelly Dome, a series of pothole lakes announce the side moraine of the glacier that formed the Delta Valley; glancing to the east, however, reveals no such formation associated with the Tanana. Even when hundreds of feet of ice were ranging through Iowa and Missouri during the Pleistocene Era; this valley in far north Interior Alaska enjoyed dry ground. 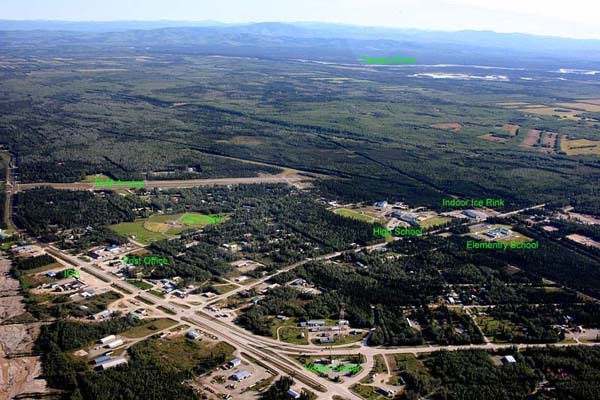 It apparently takes more than 12 inches of precipitation a year for the formation of glaciers, and the Tanana Valley, while deceptively green in the summertime, has stayed below that limit for eons. Glacier fans can observe several active ice rivers just a few miles south in the Alaska Range. A quick flight down the pass to Paxson will take one past Black Rapids Glacier, notorious as the ‘Galloping Glacier’ for its violent advance towards the Richardson Highway in the late 30s. As the canyon opens up at Summit Lake, to the left is the beautiful and many-faced Castner Glacier. Summit Lake, just below Isabel Pass, is noted for fishing; airstrips are near the lake and at Paxson. Flying west from Delta toward Fairbanks, one crosses the Tanana Flats, a largely untouched river bottomland area traversed by both clear water and braided, silty, glacial streams. To the right, the rolling Tanana Hills are really sand dunes in disguise. They have been stable long enough to support climax vegetation in the form of old-growth spruce, but a sharp eye will catch the characteristic shape of aeolian (wind shaped) formation. With a minimum of searching, wildlife fans can spot everything from bison and moose to porcupines, depending on how brave you or your pilot are. 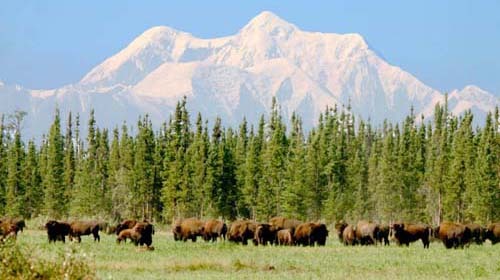 The flats to the east of the Clearwater farming area are prime moose spotting grounds, and the west bank of the Delta River is the summer range of the Delta herd of American bison. 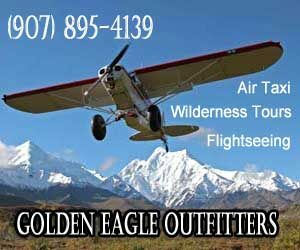 Golden Eagle Outfitters offers Wildlife Viewing, Flightseeing and Custom Tours All photos and excerpts are courtesy of Golden Eagle Outfitters. 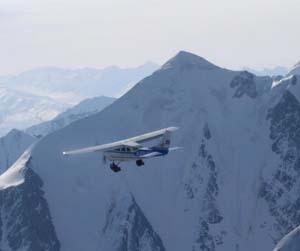 For those who have limited time or who aren’t comfortable with a remote wilderness experience, a flightseeing trip is a low impact opportunity to experience the beauty and wildness of Alaska. In a one-hour air charter flight you can see the rugged, untouched beauty of the Alaska Range. You will experience breathtaking views of the beautiful, ghost-shaped, 13,800 foot (4,206 m) Mt. Hayes which is only one of many awesome mountain peaks you will see on your flight. 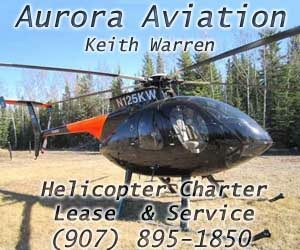 You will also be flying over several rugged mountain glaciers including Trident, Hayes, and Black Rapids. We have a Granite Mountain flight where Dall sheep, caribou, and possibly bears and wolves can be seen. As you cross the Tanana Valley you can see moose and one of the few free ranging bison herds in the U.S. This flight also offers the opportunity to experience the beauty, vastness, and remoteness of Alaska’s wilderness. Flights can be customized to view such events as the calving of the Fortymile Caribou Herd or concentrations of moose in the fall during breeding season as well as many other wildlife events. 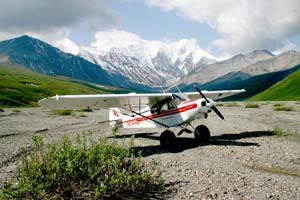 One- passenger flights are available in the Super Cub. Up to five-passenger flights are available in the Cessna 206. We would be delighted to show you some of the Alaska wilderness we know best! Please call us today (907)895-4139.